Definition at line 110 of file llnamevalue.h. Definition at line 108 of file llnamevalue.cpp. Definition at line 419 of file llnamevalue.cpp. References baseInit(), i, init(), NameValueClassStrings, NameValueSendtoStrings, NV_BUFFER_LEN, NVC_EOF, NVC_READ_ONLY, NVS_EOF, NVS_SIM, S32, and type. Definition at line 346 of file llnamevalue.cpp. References LLStringTable::addString(), baseInit(), u_name_value_reference::f32, llendl, llinfos, mClass, mName, mNameValueCB, mNameValueReference, mNVNameTable, mSendto, mStringClass, mStringSendto, mStringType, mType, mUserData, NameValueTypeStrings, NULL, NVC_READ_ONLY, NVC_READ_WRITE, NVS_SIM, NVT_ASSET, NVT_F32, NVT_NULL, NVT_S32, NVT_STRING, NVT_U32, NVT_U64, NVT_VEC3, u_name_value_reference::s32, u_name_value_reference::string, u_name_value_reference::u32, u_name_value_reference::u64, and u_name_value_reference::vec3. Definition at line 329 of file llnamevalue.cpp. Definition at line 337 of file llnamevalue.cpp. Definition at line 593 of file llnamevalue.cpp. References u_name_value_reference::f32, mName, mNameValueReference, mNVNameTable, mType, NULL, NVT_ASSET, NVT_F32, NVT_S32, NVT_STRING, NVT_U32, NVT_U64, NVT_VEC3, LLStringTable::removeString(), u_name_value_reference::s32, u_name_value_reference::string, u_name_value_reference::u32, u_name_value_reference::u64, and u_name_value_reference::vec3. Definition at line 113 of file llnamevalue.cpp. References gNVNameTable, mClass, mName, mNameValueCB, mNameValueReference, mNVNameTable, mSendto, mStringClass, mStringSendto, mStringType, mType, mUserData, NameValueClassStrings, NameValueSendtoStrings, NameValueTypeStrings, NULL, NVC_NULL, NVS_NULL, NVT_NULL, and u_name_value_reference::string. Definition at line 764 of file llnamevalue.cpp. References llendl, llinfos, mName, mNameValueCB, and mUserData. Referenced by operator=(), setAsset(), setF32(), setS32(), setString(), setU32(), and setVec3(). Definition at line 646 of file llnamevalue.cpp. References llendl, llerrs, mName, mNameValueReference, mType, NULL, NVT_ASSET, and u_name_value_reference::string. Referenced by LLAssetInfo::setFromNameValue(), and tut::namevalue_test::verifyChange(). Definition at line 139 of file llnamevalue.h. Definition at line 150 of file llnamevalue.h. Definition at line 659 of file llnamevalue.cpp. References u_name_value_reference::f32, llendl, llerrs, mName, mNameValueReference, mType, NULL, and NVT_F32. Definition at line 672 of file llnamevalue.cpp. References llendl, llerrs, mName, mNameValueReference, mType, NULL, NVT_S32, and u_name_value_reference::s32. Definition at line 140 of file llnamevalue.h. Definition at line 151 of file llnamevalue.h. Definition at line 633 of file llnamevalue.cpp. References llendl, llerrs, mName, mNameValueReference, mType, NULL, NVT_STRING, and u_name_value_reference::string. Referenced by LLViewerJointAttachment::addObject(), LLPanelGroupInvite::addUsers(), LLVOAvatar::dumpBakedStatus(), LLVOAvatar::getFullname(), LLFloaterReporter::getObjectInfo(), LLAvatarSendIM::handleEvent(), LLAvatarGiveCard::handleEvent(), LLObjectMute::handleEvent(), LLObjectEnableMute::handleEvent(), LLVOAvatar::idleUpdate(), process_offer_callingcard(), LLVOAvatar::renderSkinned(), request_friendship(), LLPanelAvatar::setAvatar(), LLHoverView::updateText(), LLVOAvatar::updateVisibility(), and tut::namevalue_test::verifyChange(). Definition at line 138 of file llnamevalue.h. Definition at line 149 of file llnamevalue.h. Definition at line 685 of file llnamevalue.cpp. References llendl, llerrs, mName, mNameValueReference, mType, NULL, NVT_U32, and u_name_value_reference::u32. Definition at line 698 of file llnamevalue.cpp. References llendl, llerrs, mName, mNameValueReference, mType, NULL, NVT_U64, and u_name_value_reference::u64. Definition at line 723 of file llnamevalue.cpp. References llendl, llerrs, mName, mNameValueReference, mType, NULL, NVT_VEC3, and u_name_value_reference::vec3. Definition at line 711 of file llnamevalue.cpp. References llendl, llerrs, mName, mNameValueReference, mType, NVT_VEC3, and u_name_value_reference::vec3. Definition at line 133 of file llnamevalue.cpp. References LLStringTable::addString(), u_name_value_reference::f32, gNVNameTable, gUserCallbackMap, llendl, llfinite, llwarns, mClass, mName, mNameValueCB, mNameValueReference, mNVNameTable, mSendto, mStringClass, mStringSendto, mStringType, mType, mUserData, NameValueTypeStrings, NULL, NVC_CALLBACK, NVC_NULL, NVC_READ_ONLY, NVC_READ_WRITE, NVS_DATA_SIM, NVS_DATA_SIM_VIEWER, NVS_NULL, NVS_SIM, NVS_SIM_VIEWER, NVT_ASSET, NVT_F32, NVT_NULL, NVT_S32, NVT_STRING, NVT_U32, NVT_U64, NVT_VEC3, u_name_value_reference::s32, S32, str_to_U64(), u_name_value_reference::string, u_name_value_reference::u32, u_name_value_reference::u64, and u_name_value_reference::vec3. Definition at line 737 of file llnamevalue.cpp. 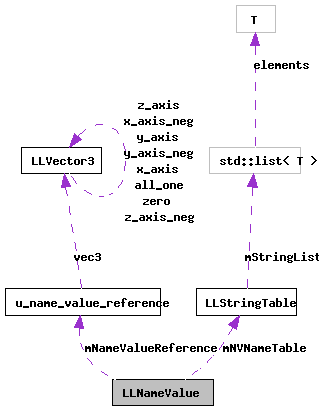 References u_name_value_reference::f32, llendl, llerrs, LLVector3::magVec(), mNameValueReference, mStringType, mType, NVT_F32, NVT_S32, NVT_STRING, NVT_U32, NVT_VEC3, u_name_value_reference::s32, u_name_value_reference::string, u_name_value_reference::u32, and u_name_value_reference::vec3. Definition at line 1120 of file llnamevalue.cpp. References u_name_value_reference::f32, FALSE, llendl, llerrs, LLVector3::magVecSquared(), mNameValueReference, mStringType, mType, NVT_F32, NVT_S32, NVT_STRING, NVT_U32, NVT_VEC3, u_name_value_reference::s32, u_name_value_reference::string, u_name_value_reference::u32, and u_name_value_reference::vec3. Definition at line 789 of file llnamevalue.cpp. References a, callCallback(), u_name_value_reference::f32, FALSE, llendl, llerrs, mClass, mNameValueReference, mType, NULL, NVC_CALLBACK, NVC_READ_ONLY, NVT_ASSET, NVT_F32, NVT_S32, NVT_STRING, NVT_U32, NVT_U64, NVT_VEC3, u_name_value_reference::s32, u_name_value_reference::string, TRUE, u_name_value_reference::u32, u_name_value_reference::u64, and u_name_value_reference::vec3. Definition at line 1152 of file llnamevalue.cpp. References u_name_value_reference::f32, llendl, llerrs, llformat(), mNameValueReference, mStringType, mType, LLVector3::mV, NVT_ASSET, NVT_F32, NVT_S32, NVT_STRING, NVT_U32, NVT_U64, NVT_VEC3, u_name_value_reference::s32, u_name_value_reference::string, u_name_value_reference::u32, u_name_value_reference::u64, U64_BUFFER_LEN, U64_to_str(), u_name_value_reference::vec3, VX, VY, and VZ. Referenced by LLAgent::getName(), and printNameValue(). Definition at line 1143 of file llnamevalue.cpp. References llformat(), mName, mStringClass, mStringSendto, mStringType, and printData(). Definition at line 777 of file llnamevalue.cpp. References mSendto, NVS_DATA_SIM, and NVS_DATA_SIM_VIEWER. Definition at line 783 of file llnamevalue.cpp. References mSendto, NVS_DATA_SIM_VIEWER, and NVS_SIM_VIEWER. Definition at line 901 of file llnamevalue.cpp. References callCallback(), FALSE, mClass, mNameValueReference, mType, NULL, NVC_CALLBACK, NVC_READ_ONLY, NVT_ASSET, u_name_value_reference::string, and TRUE. Definition at line 952 of file llnamevalue.cpp. References callCallback(), u_name_value_reference::f32, FALSE, mClass, mNameValueReference, mType, NVC_CALLBACK, NVC_READ_ONLY, NVT_F32, and TRUE. Definition at line 984 of file llnamevalue.cpp. References callCallback(), u_name_value_reference::f32, FALSE, mClass, mNameValueReference, mType, NVC_CALLBACK, NVC_READ_ONLY, NVT_F32, NVT_S32, NVT_U32, S32, u_name_value_reference::s32, TRUE, and u_name_value_reference::u32. Definition at line 846 of file llnamevalue.cpp. References callCallback(), FALSE, mClass, mNameValueReference, mType, NULL, NVC_CALLBACK, NVC_READ_ONLY, NVT_STRING, u_name_value_reference::string, and TRUE. Definition at line 1040 of file llnamevalue.cpp. References callCallback(), u_name_value_reference::f32, FALSE, llendl, llerrs, mClass, mNameValueReference, mStringType, mType, NVC_CALLBACK, NVC_READ_ONLY, NVT_F32, NVT_S32, NVT_U32, u_name_value_reference::s32, S32, TRUE, and u_name_value_reference::u32. Definition at line 1092 of file llnamevalue.cpp. References a, callCallback(), FALSE, llendl, llerrs, mClass, mNameValueReference, mStringType, mType, NVC_CALLBACK, NVC_READ_ONLY, NVT_VEC3, TRUE, and u_name_value_reference::vec3. Definition at line 1705 of file llnamevalue.cpp. Definition at line 1665 of file llnamevalue.cpp. Definition at line 1426 of file llnamevalue.cpp. Definition at line 2061 of file llnamevalue.cpp. Definition at line 1604 of file llnamevalue.cpp. Definition at line 1223 of file llnamevalue.cpp. Definition at line 2129 of file llnamevalue.cpp. Definition at line 1332 of file llnamevalue.cpp. Definition at line 1520 of file llnamevalue.cpp. Definition at line 1938 of file llnamevalue.cpp. Definition at line 1187 of file llnamevalue.cpp. Definition at line 1815 of file llnamevalue.cpp. Definition at line 1745 of file llnamevalue.cpp. Definition at line 2000 of file llnamevalue.cpp. Definition at line 1876 of file llnamevalue.cpp. Definition at line 191 of file llnamevalue.h. Referenced by baseInit(), getClassEnum(), init(), LLNameValue(), operator=(), setAsset(), setF32(), setS32(), setString(), setU32(), and setVec3(). Definition at line 186 of file llnamevalue.h. Referenced by LLViewerObject::addNVPair(), baseInit(), callCallback(), getAsset(), getF32(), getS32(), getString(), getU32(), getU64(), getVec3(), init(), LLNameValue(), printNameValue(), LLAssetInfo::setFromNameValue(), and ~LLNameValue(). Definition at line 197 of file llnamevalue.h. Referenced by baseInit(), callCallback(), init(), and LLNameValue(). Definition at line 195 of file llnamevalue.h. Referenced by baseInit(), getAsset(), getF32(), getS32(), getString(), getU32(), getU64(), getVec3(), init(), LLNameValue(), magnitude(), nonzero(), operator *(), operator%(), operator+(), operator-(), operator/(), operator=(), printData(), setAsset(), setF32(), setS32(), setString(), setU32(), setVec3(), and ~LLNameValue(). Definition at line 196 of file llnamevalue.h. Referenced by baseInit(), init(), LLNameValue(), and ~LLNameValue(). Definition at line 193 of file llnamevalue.h. Referenced by baseInit(), getSendtoEnum(), init(), LLNameValue(), sendToData(), and sendToViewer(). Definition at line 190 of file llnamevalue.h. Referenced by baseInit(), getClass(), init(), LLNameValue(), and printNameValue(). Definition at line 192 of file llnamevalue.h. Referenced by baseInit(), getSendto(), init(), LLNameValue(), and printNameValue(). Definition at line 188 of file llnamevalue.h. Referenced by baseInit(), getType(), init(), LLNameValue(), magnitude(), nonzero(), operator *(), operator%(), operator+(), operator-(), operator/(), printData(), printNameValue(), setU32(), and setVec3(). Definition at line 189 of file llnamevalue.h. Referenced by baseInit(), getAsset(), getF32(), getS32(), getString(), getTypeEnum(), getU32(), getU64(), getVec3(), init(), LLNameValue(), magnitude(), nonzero(), operator *(), operator%(), operator+(), operator-(), operator/(), operator=(), printData(), setAsset(), setF32(), setS32(), setString(), setU32(), setVec3(), and ~LLNameValue(). Definition at line 198 of file llnamevalue.h.